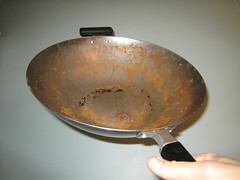 I've always had issues with this wok. Basically when it dries or is dried, it always develops rust spots. Right before use i always have to reclean it to wipe off the spots, but this seems weird and leaves me feeling unsettled. I've "tried" seasoning it, but i don't think it worked, or i did it horribly wrong. So the question is - do i throw it out and get a new one, or can this thing be fixed?? If you washed it with soap, you have un-seasoned it. Use only hot water after seasoning. Also, after using only hot water and a scrubbie to clean it, give it a wipe and then turn it upside down over an element on low to finish drying it. If you put it away without it being completely dry, it will rust. Thanks for all your comments!!! I'm not sure i'm down with a cooking utensil that i DON'T wash with soap. I'm also not sure about turning on the stove after i cook to dry dishes, these all seem like a lot of work :) I guess for the love of wok people will do this, i'm just not sure its me. I think the canal may be the way to go. Tiana - very interesting point. I very rarely stir fry meat either, so i guess it would be fine for me too... its just that fat from oil/whatever wouldn't get cleaned and that just weirds me out, but i guess the "seasoning" is really oil/fat anyways so thats what is desired.